Please post your questions about the build and links to other information like mod threads, schematics, pictures etc here. 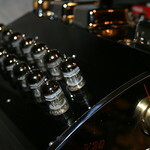 Please re-post the information that is on other forums on carveraudio.com because that information may not be accessible by non-members of those forums. RobertR posted this schematic on CS! I have﻿ schematics, but they have a few mistakes/changes, and Jordon doesn't want them posted until he gets them just right. We really don't need the confusion of different versions being copied to everybody. BTW, there is one error in the PS schematic - the B- voltage should read 47 volts, not -41. The amp boards are going to have to be populated by us, and they (boards and the parts for them) are on the way, shipped from Seattle last Friday, and going right to the Watershed office.. A single board for both channels, with seven tube sockets, 50-plus resistors, nearly 30 caps, and four diodes. It should be a fun weekend. The remainder of the kit parts was shipped Tuesday, and may take a week. I had the opportunity to get close up and personal with the new amp. Very schweet. Bob offered to allow me to put it in my rig and give it a spin on the M3s. How cool is that. I’ll report back with impressions and how it integrates into my rig. also try the KT88s and 6550s? We have the Crimson 275 in place of the mighty V20 in Cabin 12. Y’all gonna love this amp. Big stones, it’s driving the M3s beautifully. We’re going to roll some PSVane front end tubes in and my RCA 6L6s in and give them a go. I'm bringing literally hundreds of front end tubes for rolling. I've got different sets of power tubes to try also. I can't speak for the Carverfest amp but the power tubes in my modded Marshall responds well to power tube rolling. With any luck I can get the schematic and get my parts upgrades ordered and done while I’m here. Bob is anxious to get the process underway. Interested to know your opinion on preference for power and input tubes? Has there been a consensus on which tubes (including mfgr.) sound best?